1) Blend macadamias to a course texture in a food processor. 2) add apricots and blend until it forms a ball. 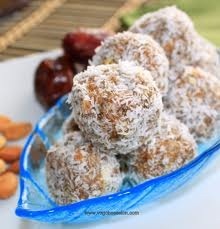 3) Roll into walnut sized balls, roll in coconut. Enjoy.